Welcome to my Microgreens garden! Microgreens are itty bitty baby greens. 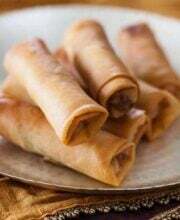 They can be grown from any type of vegetable – herbs, carrots, kale, broccoli, peas. The benefit of microgreens (other than being super cute and fancy) is that nutritionally, they are jam-packed. 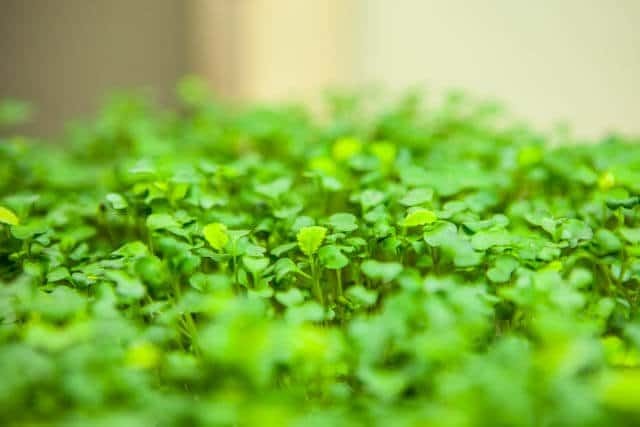 You can generally say that an ounce of broccoli microgreens has more nutritional value than a pound of broccoli. In addition – there are NO chemicals, no fertilizers. All of the growing power comes from seed + light + water + air. It’s just pure vegetable! 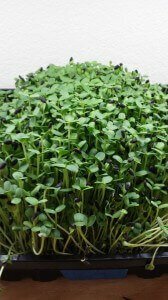 I’ll write more about microgreens + nutrition in another post. 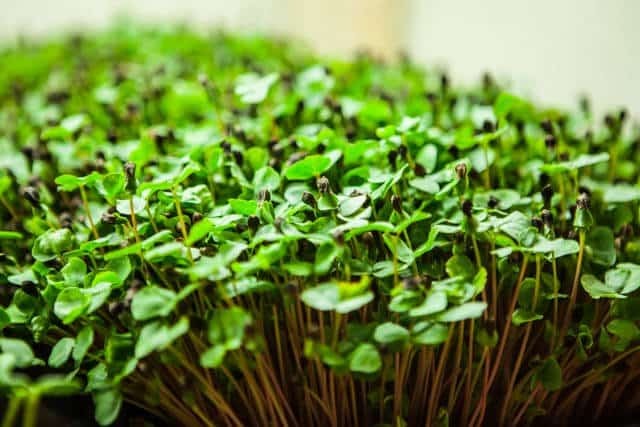 Of course, this will be an ongoing series – it’s so easy to grow microgreens that I hope you will be able to do this at home as well! I will be detailing all of my learning experiences and results as we move forward. I have been growing microgreens for a little over two months now. The “why and how” are the subject of many more posts to come. But I will tell you these little babies have got to be the easiest and maybe most nutritious things to grow. Two months doesn’t seem like a long time, especially in the gardening world, but in the world of microgreens, it means 4 harvesting cycles. 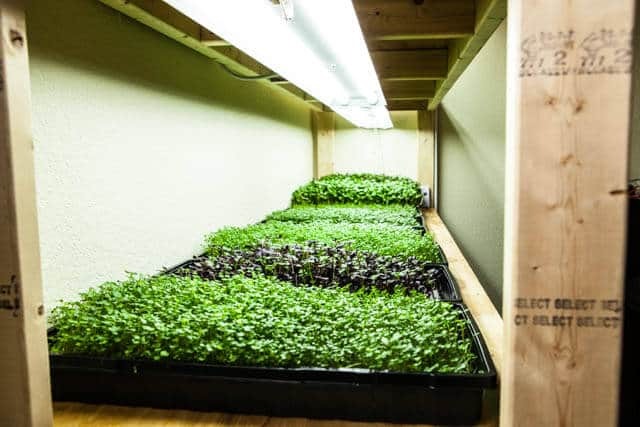 Most of these microgreens only take 14 days from seed to harvest. Along with sprouts, it’s the most “instant gratification” gardening I know of! 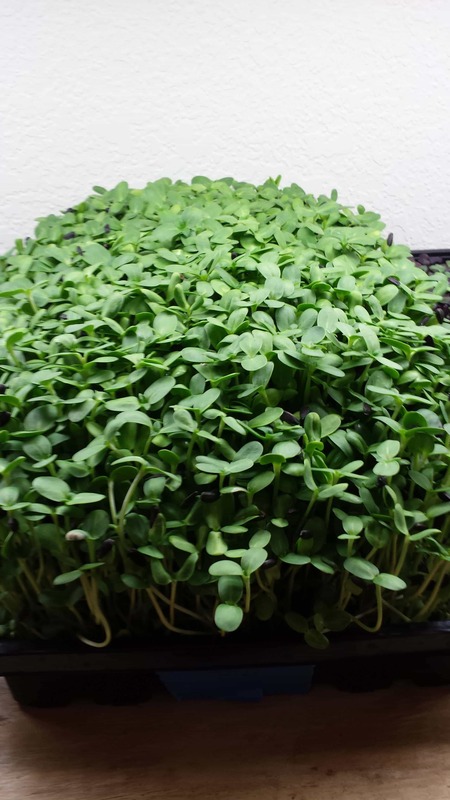 Here’s a little taste of a life cycle of sunflower microgreens – from day 3 to day 14. As I’m learning about growing microgreens, I’m journaling and capturing images everyday of each microgreen batch we grow as well as important data to help refine the growing process for everyone. 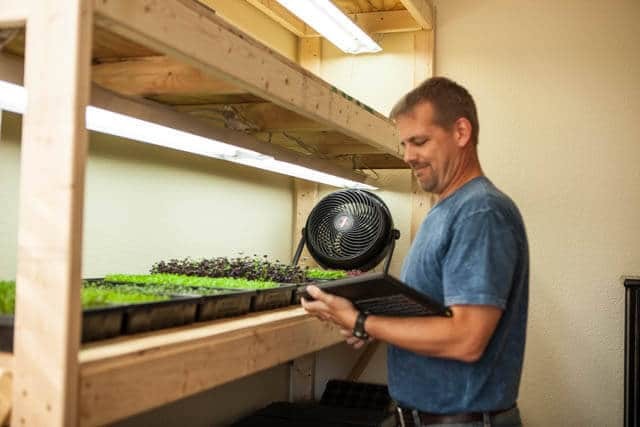 While the actual GROWING of microgreens is super-simple, keeping track of this daily data is quite a commitment. I’ll give you a little tour of what we’ve been growing before I detail how I’m capturing and managing all of the grow data. 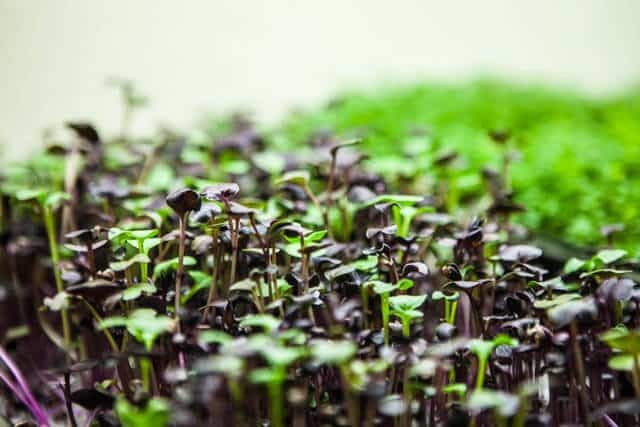 Basil microgreens taste just like basil – but more intense! Great to add to salad for a different flavor. 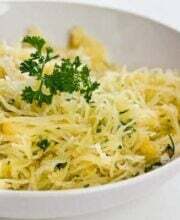 We also topped pasta with this. These are buckwheat microgreens. The leaves pop up and push the husk of the buckwheat seed up! We didn’t really like the taste of the buckwheat microgreens – slightly sour. Perhaps we’ll try a different variety. These gorgeous magenta beauties are Red Amaranth. They are especially pretty in a salad mix. So far, we haven’t been able to raise these Red Amaranth beyond this – as you can see, the microgreen is very “leggy” (long skinny stem) and the leaves aren’t developed. We’ll continue testing as I can’t wait to see what the Red Amaranth leaves mature into. Carrots! Another 2-3 days before harvest of Microgreen Carrots. So far, they taste of just a hint of carrot – the flavor isn’t very strong. We’ll see how the flavor develops when it’s time to harvest. 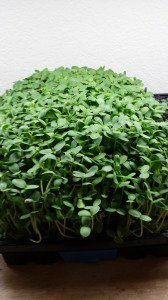 These are sunflower microgreens – one of my favorites. Yes, they really do taste like sunflower seeds! 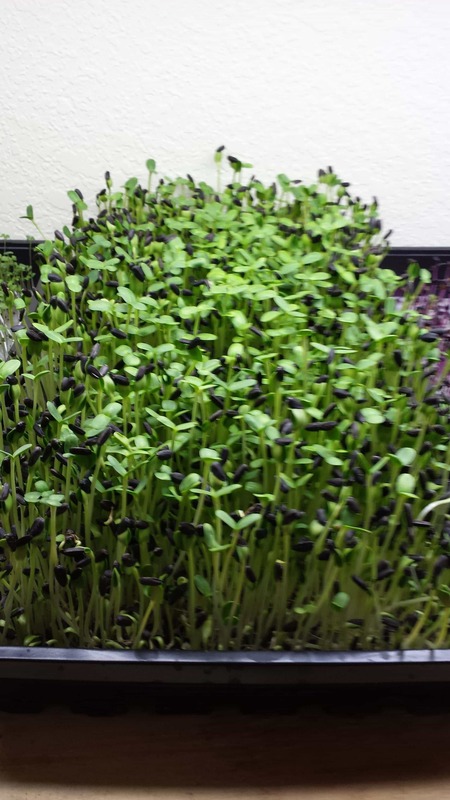 Of all the microgreens – this one is Jaden’s favorite. Radish microgreens are spicy! The deep purple color is very pretty. We’ve been growing these koi fish for 6 months now. There are about 100 of them here. They power the aquaponics garden! 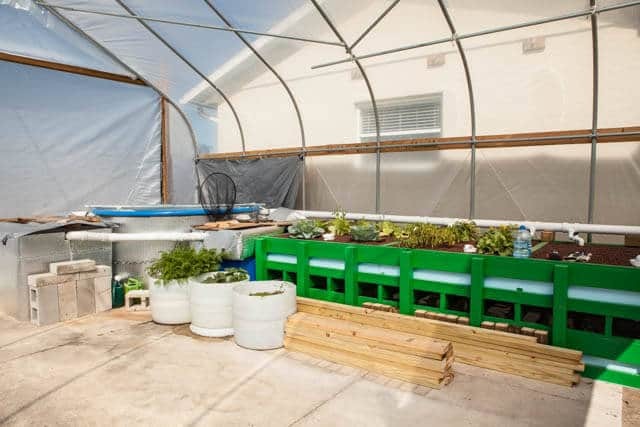 I just finished an addition to the aquaponics system – these green framing is holding up 60 square feet of grow beds with a 400 gallon sump tank below the vegetables. I’ll write more in detail later about this system. The plants didn’t do too well in the process of moving grow beds. We had them in a temporary grow bed and moved them twice in 2 weeks. They threw a hissy fit – hopefully they’ll adjust well to this new and improved grow bed. These Chinese cabbage took a little while to grow, but they seem to be doing well now. I have to test the water about once a week – we have to keep track of the pH level, ammonia, nitrites and nitrates. Everything gets logged in the database on the Lenova Yoga 2 Pro. The health of the koi fish depends on having the right balance. The fish in the aquaponics system are a little more hardy. (sensor #1 and #2) but it’s still essential to keep everything monitored. 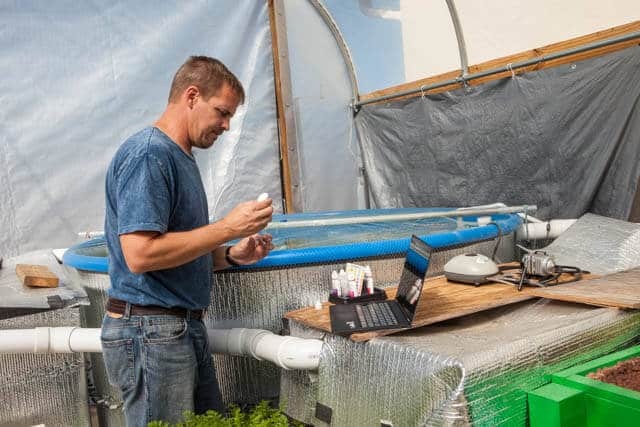 When I first started the aquaponics garden, I had to keep track of water measurements daily as hitting the right balance AND being able to keep it constant was crucial. Everything was managed on a tablet….a PAPER tablet. Pencil and graph paper. It wasn’t the most efficient, nor was even a smart idea – water + paper = bad. We recently were given a new tool – a Lenovo IdeaPad Yoga 2 Pro (an Intel 2 in 1 device) which is a dual laptop/tablet. Open it up like a laptop, it’s perfect for typing and working. Fold the screen over and it transforms into a tablet – great for inputting quick data and reviewing grow notes while I’m in the garden. The tablet only weighs 3.1 pounds and has a whopping 13.3 inch screen. 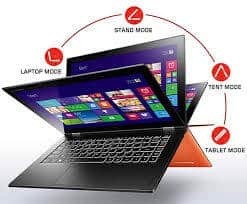 What we love about this tool is that it’s flexible – office work, field work and even entertainment (it also folds into a tent mode where you have a built-in stand). We’re very thankful to Intel for providing us with the Lenovo IdeaPad Yoga 2 Pro. Not only am I using it daily to keep track of my data – but we are pairing it with an Arduino Microcontroller that I am building (I’m a geek with a computer science degree) to monitor minute by minute data of both the aquaponics and microgreens garden. 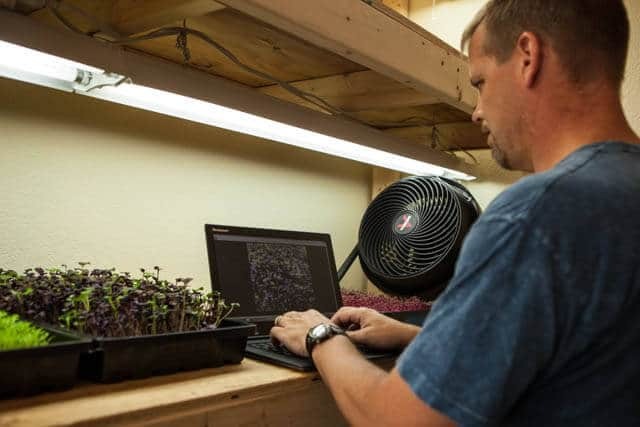 Weekly photos are logged – it helps to keep a visual progress chart as we are testing different seed varieties, seed companies and finding that right balance of temperature, airflow and humidity. 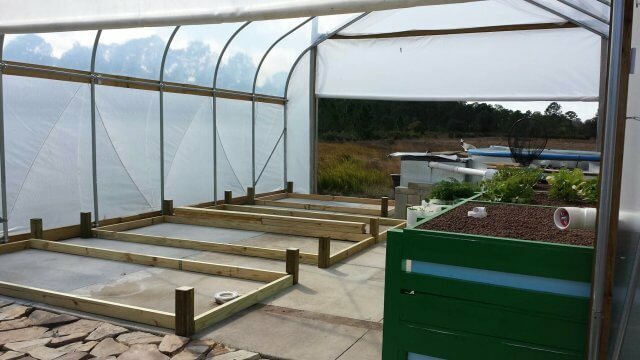 Our next phase of the “homestead” is building a raft system to grow lettuce. We tried for 6 months to grow lettuce successfully in our aquaponics system, but it just didn’t like growing in the clay pebbles. 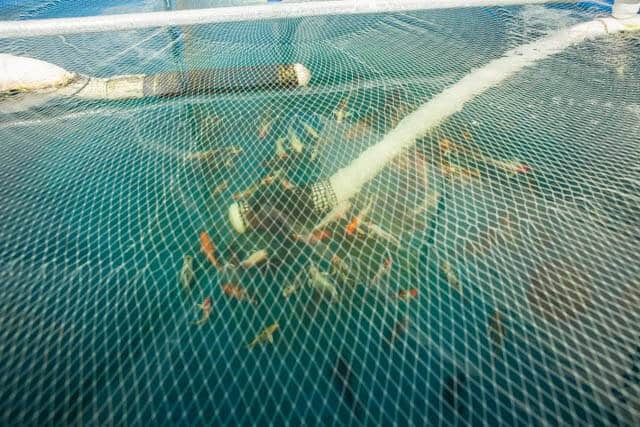 A raft system will allow the lettuce to grow suspended above the aquaponics water with its roots reaching down into the water. This will be a fun experiment. Again, we’ll be using the IdeaPad to manage this system and our experiments. So flexible. Laptop for working (and writing this post), Tablet for in the field, Tent mode for watching videos and movies. Lightweight – 3.1 pounds!! Just over 1/2 inch thick. Despite its weight and thickness – the IdeaPad is STURDY. Everything about it feels sturdy and strong. Beautifully designed. Nothing feels crammed. Windows 8 system! A few years ago, Jaden snuck in Apple devices into our home, replacing every single PC and phone. I was the last holdout. I’m a PC geek (we used to own a computer repair company and I also have computer science degree) and I feel back at home with the Windows environment. While I love the tablet configuration – it’s a little big and awkward to carry as a tablet for a long time. But then again, if it was any smaller, the laptop configuration would feel too small. When in tablet mode, the keyboard is exposed and facing out in the back. It’s uncomfortable to hold the “tablet” while trying to avoid the keys. Finding apps and files are a little tricky on this system. If you’re in laptop mode, the screen looks different than tablet mode. In conclusion, I’m very happy with the Lenovo IdeaPad Yoga 2 Pro. You’ll be seeing much more of it as an essential component of our homestead moving forward. Absolutely. 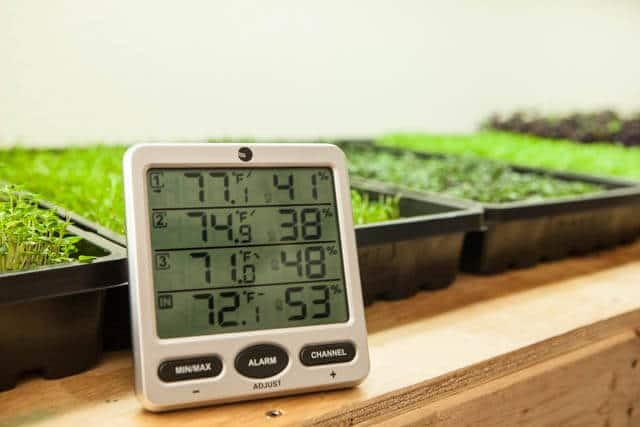 Higher temperatures and lots of sunlight will need closer monitoring of the soil water content. Check more frequently to ensure soil is moist but not flooded. Your growing time is extended and your legginess on some greens is based on your choice and set up of light. You can go down to less than a week growing time and perfect microgreens if you adjust/modify the light. what are the seeds growing on? I’ve seen soil and hydroponic techniques, just wondering which route you chose! We have used both techniques.We generally use the soil techniques when doing larger seeds that require soaking such as sunflower and pea shoots. We use the grow matts for most other seeds like broccoli and seed mixes. 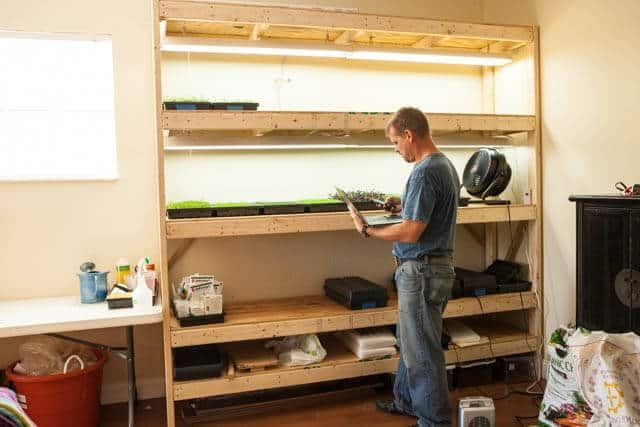 I am very new to indoor growing and find what you are doing so fantastic with the microgreens and the aquaponic green house. 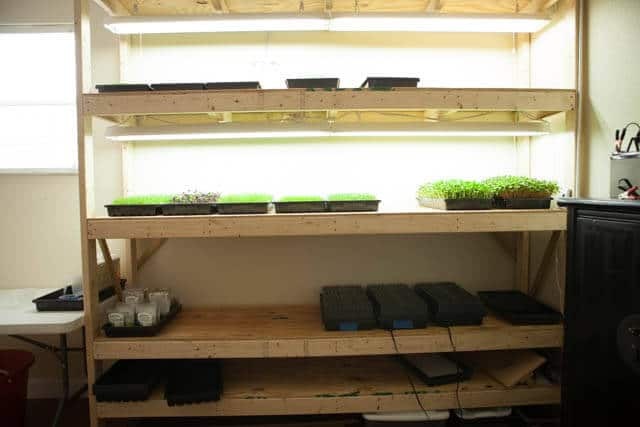 I have a question if you don’t mind, over your microgreens what is the bulb you use and what is the spacing on your shelves? Also how many (oz.) of seed dose it take to seed a tray(10″x20″ from the looks of them.)? Keep up the good work and postings. Thank you for your help. Nitrates are a naturally occurring component of vegetables and fruits and some (particularly root vegetables) are substantially higher than others e.g. Beets, Arugula, Oak Leaf Lettuce, Basil, Rocket Lettuce, Rhubarb, Cilantro etc are very high. 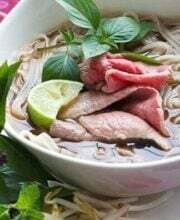 Nitrates convert to nitrites and nitric oxide which is generally fine for most people but not me, because it causes vasodilation (lowers blood pressure); in my case that can be fatal. Juicing creates even higher concentrations of nitrates. ps- I grew up in Winter Park. 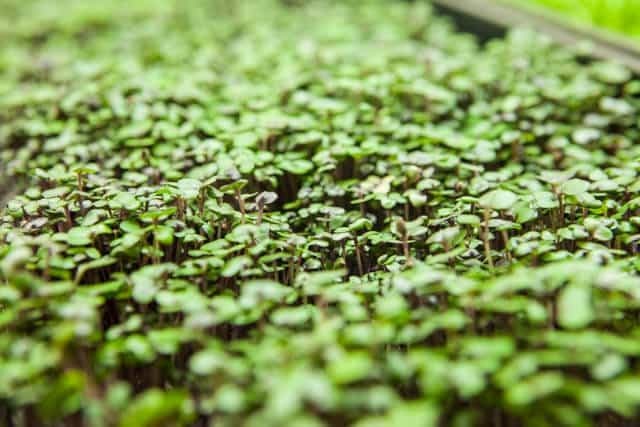 There is no requirement for special seeds to grow microgreens. 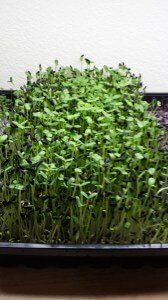 Most edible plants will work as microgreens. 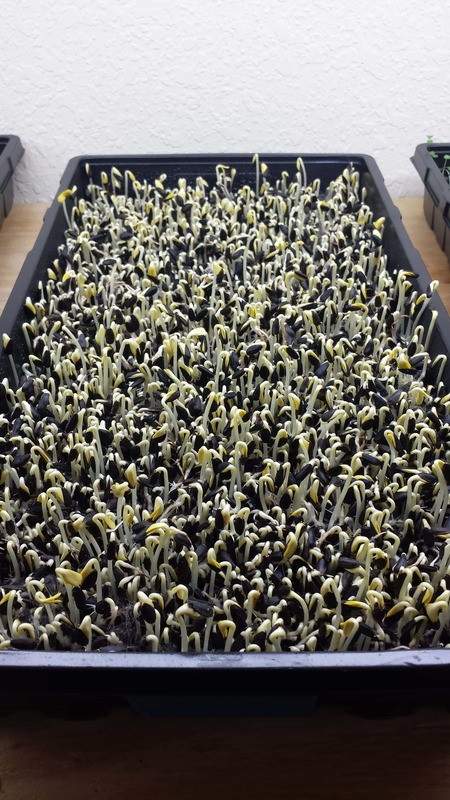 However, a good number of seed providers are stocking seeds for microgreens which have two advantages. First being seed manufactures mixes. 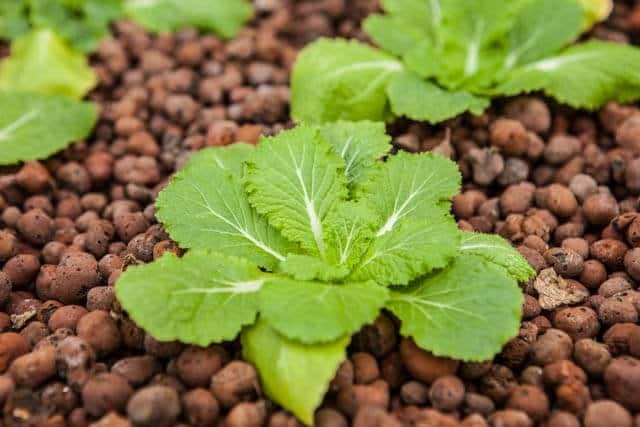 They will premix seeds from plants that have similar sprouting and growing times and form basic salad type mixes. These mixes are excellent for first time growers in that you get a mix of greens without growing five or six flats worth and they work well together. Secondly, microgreen seeds tend to be less expensive per volume of seeds. I’m not sure why they are less expensive, perhaps the quality of the mature plant is not as nice as some higher cost seeds. 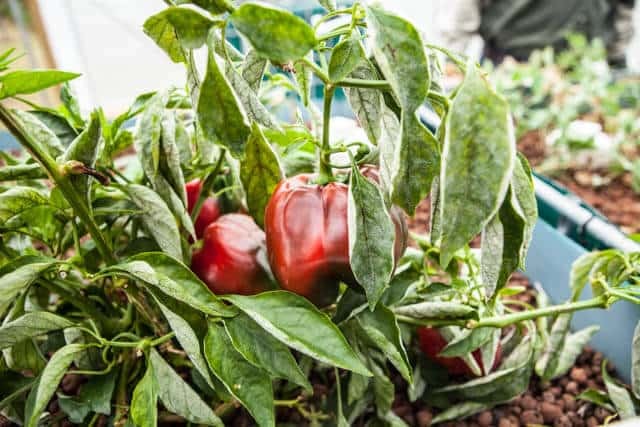 As we are only concerned with the first stages of the plant, quality of mature plants doesn’t play into consideration. Having said that, I have tried growing a few plants out like bok choi and peas. The plants did fine, but did not to flourish or grow as well as “non-microgreen” seeds. 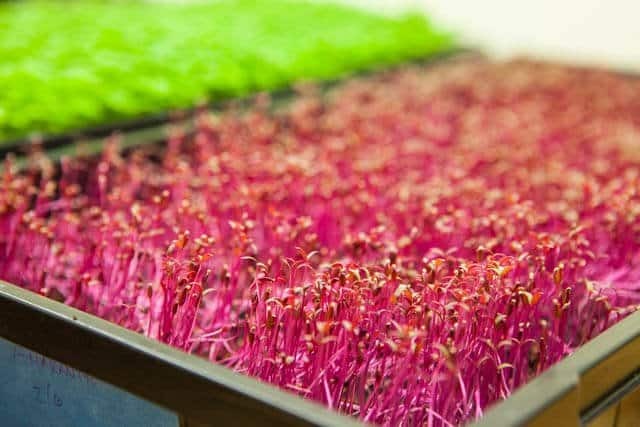 How do you prepare the micro greens? Do you eat them raw as salads or can you cook them (stir fry, etc)? We eat them raw in salads, mostly replacing a lot of the lettuce (which isn’t nutritionally that great). I try not to cook it, which will destroy a lot of the nutritional value of the microgreens. I’ll just stir it in any cooked dish after the heat is turned off and just before serving. Thanks Jaden! I’m looking forward to the “how” series on growing them =) Hubby is not a veggy lover so this is a great way to a healthier eating habit. I live in southern California (dry heat) so suggestions on how to keep a 50% humidity would be very helpful. Cool! I was going this 17 years ago! This prompted me to look into micro greens myself and seed is on the way. Using some prior experience I’m going to go for a small/medium sized grow in a 2 bedroom condo with a rotating, perpetual harvest where I’m trimming and reseeding every few days. 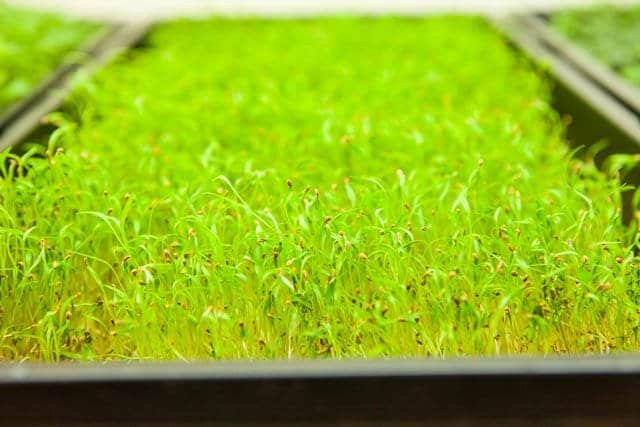 A friend in the agricultural industry says that Micro greens are the food of the future. Can’t wait to read more about your grow! Really love the information on the microgreens and am looking forward to updates in the future. I’m really glad I found your site! 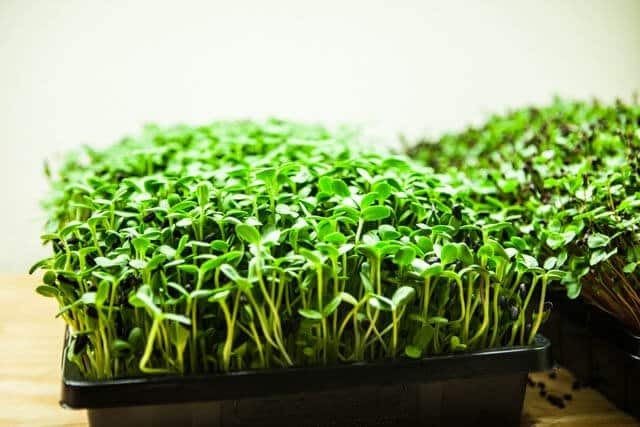 This work on micro greens is fascinating to me – I used to make my own sprouts. May I ask, where do you buy your seed? It seems that you would need to find a good source for bulk organic seed. Thank you in advance for whatever info you are able to provide. I have been using seeds from two main sources currently. They are Johnny Seeds and Growing Microgreens. Of course we are always looking for new sources. Hello, my name is Miles and I am so impressed with your site. I found your web site from my research on chicken coops. Yes Scott, I think your coop is the best I have seen. I am new at rising chickens and want to build my first coop. On the site BYC I read and viewed all your pictures and my wife thinks we could build one. I would be thankful if you could email your plans. You shared that you have a detail plan on framing and one showing the hardware cloth and finishing work. With step by step info I think we could build it. Again, thank you for your help and how are your chickens? Hi!!! wow!! great stuff. am interested in your digital control system as i am thinking of getting into aquaponics as a retirement project. 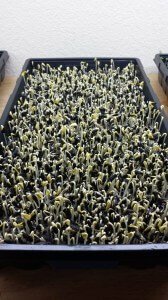 I have land in Spain (Europe) and will be devoting it soley for aquaponics. Thanks for the sire.. great job you are doing. Re: the amaranth “legging” – a friend who was a greenhouse supervisor for a university had a trick for seedlings that “legged” and died back. She put the next batch about 6″ from the lights until they got real leaves going. Try using a plastic basket to elevate the amaranth, so it’ll still have some air circulation. Don’t know if it’ll work for amaranth, but it’s worth a try. Good luck. By the way – great post! Are the micro greens growing in soil?